I traded lawn mowing for antenna permission at the house I'm renting now, but since I don't own the place, I'm not able to install big, heavy, or very permanent antennas. Despite the practical restrictions, I wanted to have a vertical for 40m and 80m as we slide down to the sunspot minimum. This is what I came up with, and got 60m and 30m essentially for free. The 40 foot vertical in all its glory. The curve is due to heating on one side from the early morning sun. I'd had good luck with my experiments with telescoping fiberglass fishing poles at the apartment, so I started looking around for suitable wire antenna supports. As you can see above, I've got no trees... at least none that are higher than about 15 feet. Honestly, I started planning this thing before I was absolutely sure I was going to be *allowed* anything, so I was thinking true easy-up-easy-down stealth. 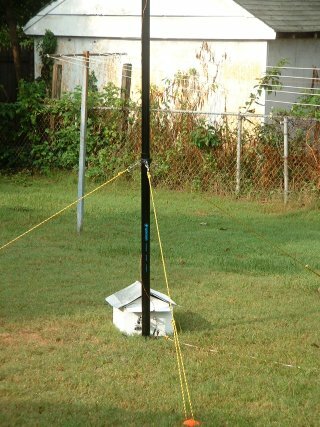 The best I came up with was the 12m Spiderbeam telescoping fiberglass pole. It seemed to have the most favorable dollars-to-height ratio that I could find, and the reviews and description made it seem very sturdy. I wasn't disappointed. The Spiderbeam pole is quite a bit more substantial than the fishing rod types that I'd used in the past, but it's still light enough to take up and down in a minute and flexible and low windload enough to use very light guys to keep it upright. I've never kept it up through winds more than about 25 MPH, and I generally take it down when I'm not using it, but I think that bottom-section guying is generally sufficient as long as you're not trying to keep it up in big storms. If I were going to leave it up permanently, I'd build a better guy ring and get or make some clamps to lock the pole in the extended position, as Spiderbeam suggests. I expect that just allowing the base to sit on the ground and guying it would provide sufficent friction to keep the thing from falling over, but I wanted something a little more positive. I drove a spike through the center of a Radio Shack guy ring and set the pole on that. It's a good solid fit to the pole and provides some peace of mind that the bottom won't kick out. I also used snap rings to hold the guys, and all of this lets me take the pole down and take it inside when I'm really not going to use it for a while. 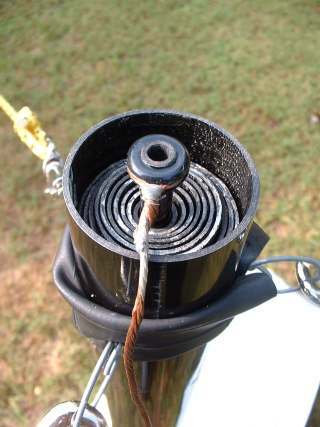 A piece of 14 gauge Flex-Weave wire is the actual radiating element, and it's wrapped around a rubber grommet to make a quick attachment to the top of the pole. 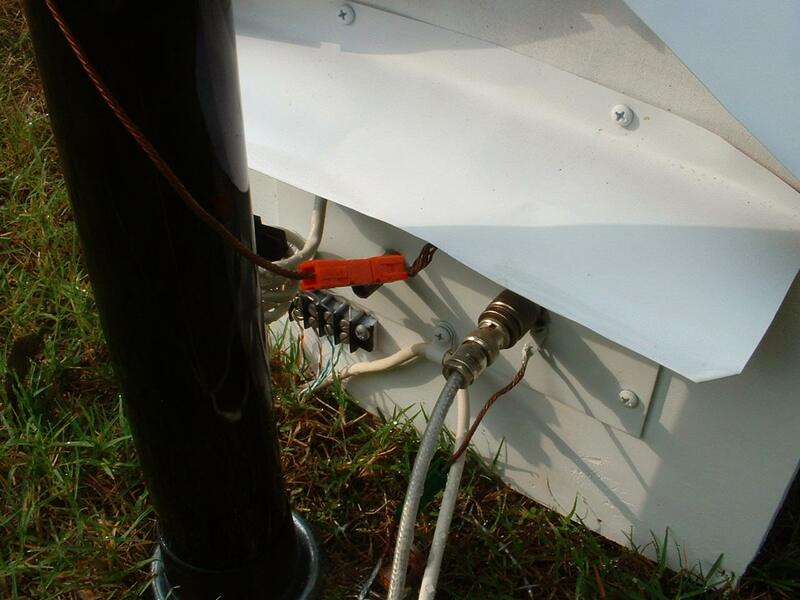 Anderson Powerpoles are used to attach the wire and ground radials to the matching network shed. I laid 27 18 gauge bare radials out to the edges of my backyard, which is about 40 feet square, give or take. This was the most labor intensive part of the project, even though I just stapled the wires down to the grass. Of course, a 40 foot element doesn't do you much good without some impedance matching. I considered just putting the remote tuner from the apartment at the base of the pole and recording tuner settings, but I like to have fast bandswitching on multiband antennas. If you've got a weather hardened autotuner, just stick it at the bottom and go. I opted to roll my own L-networks and switch between them. I ran a very simple EZNEC model that suggested I'd get good low angle radiation up through 20m, but not above (the antenna's strongest lobes go at very high angles on 17 and up). I already had plans for a 20m antenna, so I decided I'd design matching networks for 80m, 60m, 40m, and 30m. I measured the base impedance of the antenna on each band using my MFJ-259B and recorded those. I then checked it against the EZNEC model (just a 40 foot wire connected to MININEC ground, very simple). The 80m coil is #10 AWG wound on a grooved form that I made on a lathe from a piece of 3.5" PVC, but with some patience (and maybe some glue) you could just use a bare piece of pipe. The 30m, 40m and 60m matching coils are air-wound self supporting and made of #10 wire. Winding them on a 1.75" form and letting them spring out gets them very close to 2" diameter. The 60m impedance was something like 30-j60, so I just used a series inductor to cancel the reactance. For the 40m and 30m shunt elements, I used some variable capacitors I had in the junkbox. I stretched and compressed the inductor for 60m until I got a match. On 40 and 30, I just tweaked the capacitors for best mid-band SWR. On 30, 40 and 60, there's no problem covering the entire band with a single setting. 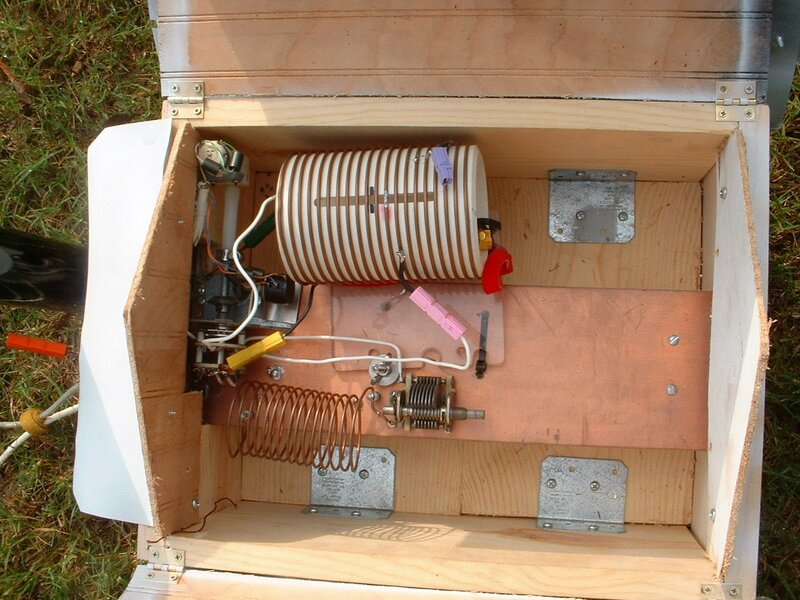 The 40m L-network and 60m inductor are slung below the ground plane. This isn't true on 80m, where the 2:1 SWR bandwidth of the antenna comes in around 70-80kHz. 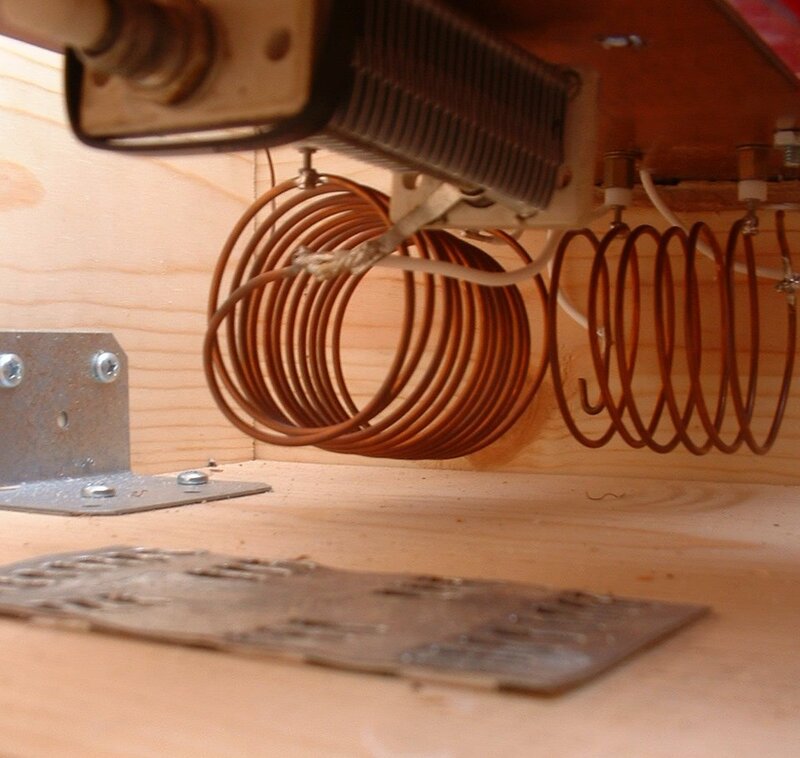 Tap placement is critical on the 80m tapped-coil network (a two inductor L network!). I really had to find the tap points experimentally to get a good match where I wanted. The antenna tap point sets the resonant frequency, and the transmitter tap point sets the resistance at resonance. Since I couldn't cover the whole band on 80m, and I wanted to be able to work both CW and SSB DX, I used two antenna-side taps, one that covers the low end of the band and one that is centered on the SSB DX window. The final electrical touch was a remote band switch. 2P5T relays are... in somewhat short supply, so I needed a homebrew solution. 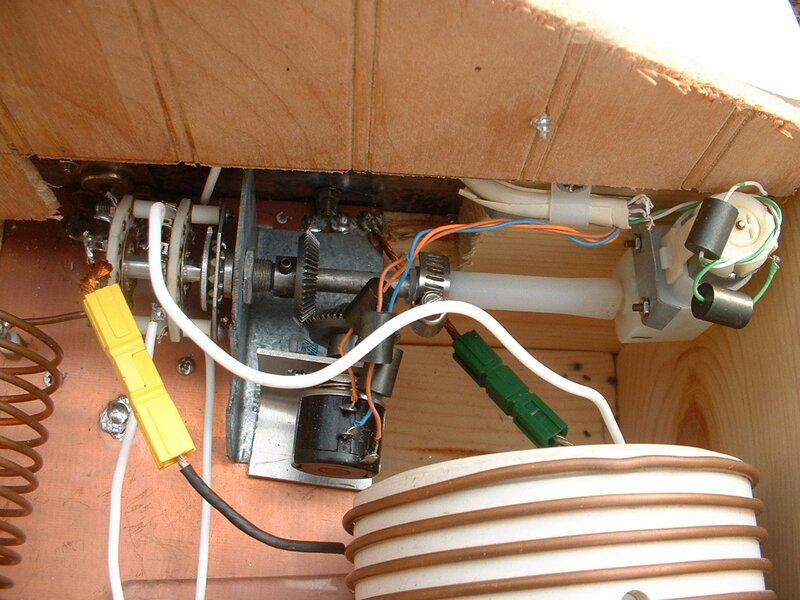 I subjected a two-pole 12-position ceramic wafer switch I had in the junk pile to the servo treatment I used on my remote tuner. I pulled the spring loaded ball out so it would turn freely, and rigged up a gearmotor and feedback pot as in the remote tuner. It would be possible to just leave the feedback out for this project. Just use an especially slow gearmotor and use RX noise as a band indicator; it's pretty obvious when you're on the right band. I had the servo box already, so I figured I'd use it. I built the shelter for the networks out of cheap lumber, leftover paneling and aluminum flashing for the roof. I haven't had any trouble even in frequent, soaking rain. I've had good results with this antenna for DX work even at 100W. It makes me feel like a big gun on the lower bands, especially compared to the 30 foot high horizontal doublet I was using at the apartment. The Spiderbeam pole is about $100 from The Wireman; add in wire, an enclosure, a switch and motor, a couple of new variable capacitors, guying materials, radial wire and other random stuff, and you're probably looking at a total of $150-$250 depending on what you've already got and whether or not you can get a deal on radial wire (I did). The pole can do multiple duty, though. 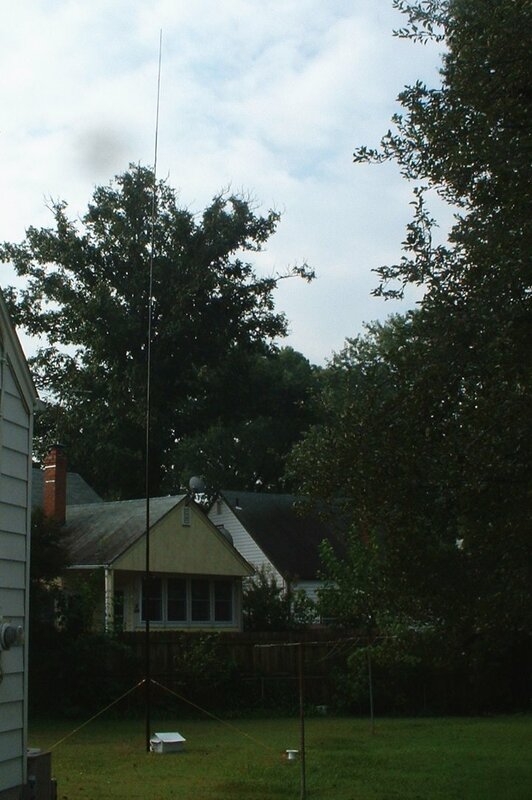 I'm also looking forward to taking the pole along for Field Day and other portable operations; it's stiff enough to support a light wire inverted vee and some ladder line for a good portable antenna.